It represents the situation while all ants construct the similar solution and thus the probability of searching newer path as zero. This kind of situation occurs mainly because of inappropriate tuning of the control parameter ρ or trail persistence. The stagnation may happen whereas its low quantity restricts the information flow, if the quantity ρ is extremely high. By generating a random number 'μ', this undesirable condition can be overcome, that is to be compared along with the intensity of pheromone trail τij. For low amount of pheromone trail the possibility of occurrence of the event μ > τij will be on upper side hence the newer path can be explored. Algorithm will stick on the particular edge, if pheromone trail is extremely high. Hence, the system is prevented from stagnating at a specific point. The modifications discussed on top that have been incorporated in the common ACO algorithm and the flowchart of the similar is represents in following figure. Here, i ∈ 1, 2 . . . | P |) such that the processing is to be carried over the resources as machines, tools, fixtures whose availability is being indicated by the corresponding ones in the binary incidence matrix I, the problem is to choose a plan as a node in graphical representation p ∈ Pi for the processing of all parts type i or ith cluster of nodes such that the total processing cost is minimized subject to the constraint such only one node is to be chosen from all clusters. 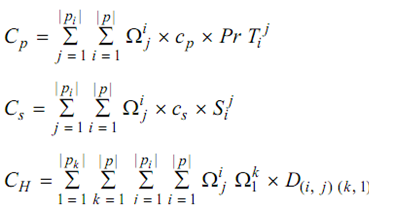 Here, A and B are the constants; Ωij is binary decision variable which considered as the value 1 if the plan j is chosen for processing of part i; CP is the cost per unit time; CS indicate the cost per step; and D (i, j)(k, l) is the hamming distance among plan j or of part i and plan l or of part k that shows the dissimilarity count of the two plans computed by using incidence matrix I.
I is a binary matrix. And λ = total number of machines, tools and fixtures = M + T + F along with each 1 as per to the requirement of particular alternative for a plan. Initialize the pheromone trails for each edge by an amount ε. Input the process plans and compute the relevant data concerned to problem such is hamming distance matrix DH for problem type 1 and DS, SI and μ for problem type 2.